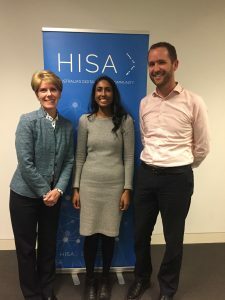 It’s been a month for social gatherings at HISA State branches with AGMs well underway and members taking the opportunity to connect with new committee members. 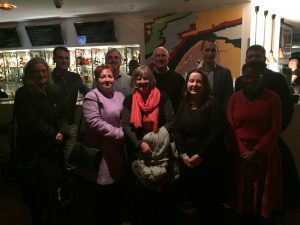 We had a great networking evening and presentation by Amelie.AI, 2016’s Hacking Health winners at the recent Victorian AGM and despite the winter weather (or maybe because of it) no one was in a hurry to leave. Julianne Oorloff , Tasneem Islam and Dr Leon Heffer from the Victoria branch committee. Sixty four Victorians voted in the state election and the first committee meeting of state branch leaders is scheduled for 10 July at HISA HQ. Let HISA or your committee members know if you have any burning issues or opportunities you would like them to address. Meanwhile, HISA Board Chair Dr David Hansen and CEO Dr Louise Schaper were in Hobart last week to catch up with HISA members in Tasmania. It was great to meet some new faces, including Elisabeth from London who found us through HISA’s event listing on MeetUp. A special shout-out to Terry and Peter who drove down from Launceston. Over drinks and nibbles at one of Hobart’s cool restaurants we discussed all things health informatics and some great connections were made. Catching up with HISA Tasmania members.